The Van Tyne Group and Thinking Engines conducted a study with several commercial construction companies looking for opportunities for unprecedented improvement. They learned that the Superintendents are the key to disrupting this industry. Discover why removing the barriers to success and properly empowering Superintendents are key to disrupting this industry. Easy to Use 2.0: User Experience Design in Agile Development for Enterprise Software The intersection of the customer, user and technology is at the heart of this concise guidebook for developing easy to use software. In Easy to Use 2.0, Sean Van Tyne expands on his previous edition, taking the complex topic of agile development for enterprise software and making it easy to understand and easy to implement. Easy to Use 2.0 is an easy to use guide to creating simple yet effective enterprise applications. A revolution is underway, a shift in dynamic that has changed the consumer-business relationship forever. This "Customer Experience Revolution" is the subject of this book by Jeofrey Bean and Sean Van Tyne. This book is essential reading for anyone wanting to understand how businesses are evolving in this new century. To learn more, please visit www.cxrevolution.com. User experience encompasses all aspect of a persons experience with an organization’s services and products. Organizations may or may not be aware of their customers’ experience with their services or products and give different degrees of attention to developing and managing their customers’ experiences. These degrees of attentions given to their customer experience can be measured and charted by phases or stages along a continuum of dedication or maturity. Based on the Capability Maturity Model Integration and the Corporate Usability Maturity, this paper presents a model of user experience maturity by level based on an organizations dedication of resources, budget, and process integration. The Pragmatic Marketer, Volume 8, Issue 4, 2010Conventional wisdom holds that the true measure of your product success is in how well it meets your business and marketing objectives. But what about the third objective—user experience? Apple, for example, has developed a reputation very different from Microsoft. Which one would you say succeeds at setting and meeting successful user experience objectives?User experience is about managing the customer side of the equation. A good UX objective needs to be specific and measurable just like good business or marketing objectives. To create your user experience objective you must have a clear understanding of your business and marketing objectives and align with your users' needs. User experience encompasses all aspects of users’ interactions with a company, its services, and its products. Prioritizing user advocacy from the beginning of a product design process puts users at the center of the process and ensures their needs are foremost in all UX design decisions.To meet your customers’ real needs and deliver simple, elegant solutions that are a joy to use, you must do much more than merely giving them what they say they want or fulfilling a checklist of features. You must have a deep understanding of your product’s market and the needs of its target users. It is essential to put your design solutions into the context of the market problems they solve, the business objectives they support, and the customer and user needs they meet. Using a scorecard helps organizations balance their strategic objectives across four perspectives: Financial, Customer, Internal Business Processes, and Learning and Growth. Each perspective of the Balance Scorecard includes objectives, measures of those objectives, target values for those measures, and initiatives. With the Balance Scorecard system, an organization can align and manage its User Experience objectives along with other key corporate objectives. Sometimes the best way to satisfy your customer’s needs is to ignore their suggestions. Suggestions may lead to incremental improvement instead of real innovative market solutions. It is only by going out and observing your customers using your solution that you will see how they interact with your products in their environment.Too many companies will include requested features that do not really solve the bigger market problems. Only by observing your customers activities—interactions with your products—do you really understand your customers’ needs. When designing your product, focus on activities your customers’ perform rather than their requests and your solution will innovate and win your market. Organizations and their products and services have a user experience regardless if the organization is consciously managing it or not! A good user experience delights customers and creates a steady revenue stream while a poor user experience detracts customers and can be the demise of an organization. Savvy organizations invest in developing their user experience strategy and process and make them central to their overall organizations’ objectives. 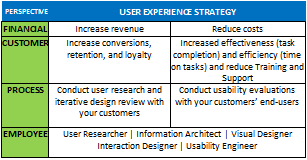 This article, shares the secret of developing a mature user experience for your organizations.The User Experience Maturity Model is a framework that describes an organizations maturity along a continuum. It defines where an organization is and provides the instructions to reach the next level. 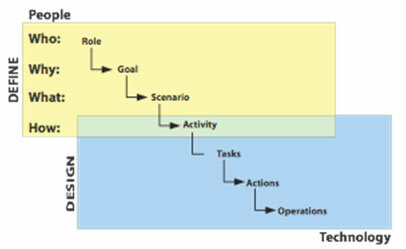 The model also provides a benchmark for your organization and relative comparison to other organizations.In this article you will learn about the five levels defined along the continuum of user experience maturity starting at the initial level of no user experience management to customer focused organization. 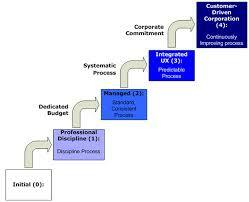 Organizations progress through a sequence of stages as their user experience management processes evolve and mature. You can match your organization with the following descriptions to see what your next stage is likely to be.This article is based on a white paper that I presented at HCII 2009 which is based on a workshop that I did for Managing Innovation Conference 2007. The Pragmatic Marketer, Volume 5, Issue 3, 2007In this article, Sean explains the difference needs of the customer and user for enterprise solutions. He covers everything from research and design validation through conducting usability and supporting corporate strategy. Sean explains how to conduct research for these difference audiences along with how to iterate designs for validation and evaluate the design for ease-of-use. Sean Van Tyne, June 2007Through his tenure of developing User Experience departments, strategies, processes, policies, and procedures for a variety of companies in a variety of markets and inspired by the Capability Maturity Model Integration and the Corporate Usability Maturity, Sean developed this Corporate User Experience Maturity model. The Pragmatic Marketer, Volume 5, Issue 1, 2007In this article, Sean explains how Product Design works with Management and Development throughout the product lifecycle. Product Design elaborates on the solution that Management provides for Development to build. Product Design partners with Management early in the product lifecycle to quantify, analyze, and validate solutions, and partners with Development to design, build, and test the solution, thus fulfilling its role as a bridge between these two functions. Mr WordPress on Are Your Customers Analog or Digital?